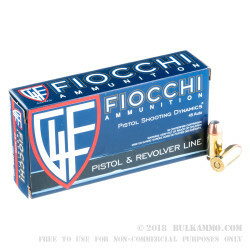 This is a very compelling argument on Fiocchi’s behalf to keep you shooting a single round for the range and for in your self-defense firearm. The 230 grain Jacketed Hollow point round is slightly higher priced than most bargain basement range quality rounds. The ballistics offer surprisingly good metrics for the round and the idea that you can declutter your shooting shelves seems to make a great deal of sense. Hitting a target with a 230 grain projectile that exits the bore at 850 feet per second, and delivers energy in excess of 385 ft. lbs. says something about the capability of the round for real world use. Sure there are better loads available if all you want is velocity and energy. 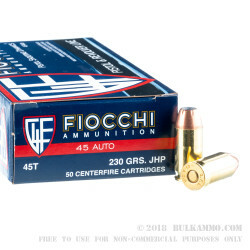 But when you need a great price on top tier ammunition and you want a heavy projectile; reliable feeding and extraction; a quality, reloadable brass and simplicity in your ammunition choices, you might consider a nicely balanced load from industry powerhouse Fiocchi. 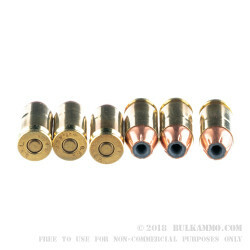 This round is suitable for use in any .45 ACP firearm and may be a perfect replacement for the several loads you already stock on your ammo shelf. Simplify your life by forgetting about the several loads you bought to test out for self-defense, and just grab some boxes of this stuff to get where you need to be.